Quan Y cave, or Military Hospital cave in Cat Ba island, built in the American war has become the pride of Vietnam Military Medicine. Today, the hospital is no longer there , but the historical value of the cave still remains. Furthermore, there are traces of a historic time. Located about 15km from centre of Cat Ba town, Military Hospital cave is built in the area of Tran Chau ward, belongs to Catba National Park, exit from the cave is on the other side of the mountain with a sloping path surrounded by trees. The cave was built with special structure with limestone powder and quartz formed by coastal sediments plus sparkling stalactites of natural shapes, creating misterious and romantic space. 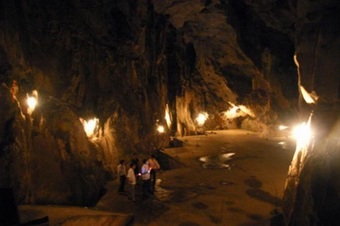 Previously the cave was named Hung Son after a general of Tran Dynasty who fought in the historic Bach Dang battle and who discovered the cave. In American War, around 1960s the cave was built into a hospital for wounded soldiers and sheltering place to stay away from bombings for local people as well as people from nearby Bach Long Vy island, the hospital was able to host 100 patients. In addition to 17 function rooms there are also swimming pools, cinema and a gymnasium. After the war time local people still came here in typhoons as a shelter. Military Hospital cave is really a master piece of the war time, because the construction was completely built inside the mountain, a makeshift hospital built in the cave with a capacity to treat up to 100 peope. The construction is about 120m above the sea level with the main entrance facing Khe Sau valley, the hospital is an ideal place for rehabilitation. The hospital was built with assistance from Chinese construction experts. Through the ups and downs of history, Military Hostpital cave structures are still intact. The construction works are self contained with reinforced concrete, the length between the two caves about 200 meters, designed to have the front door in the west and back door facing east. Over three thick layers of entrance door is the hospital with 3 floors, of which 1st floor is the main area with 14 function rooms such as operating rooms, waiting rooms and medicinal room, 2nd floor is cinema and practising room, fitness test, 3rd floor is reception, rooms for guards and officers. Built as a hospital of war time, Military Hospital cave is equiped with a system of entrances and exits, drainage, ventilation ... perfect. In the cave are traces of the wood stick to the wall as medicine cabinets, emergency exit from 3rd floor to the first floor leading to back door is hidden behind big stalagmites on the back side of the mountain. 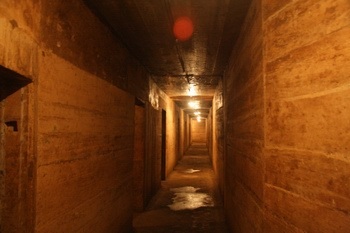 The Military Hospital cave represents a big military hospital of the war time with full equipments and treatment area for hundreds of people. There used to be an old soldier working as a guide in the cave, he entertained tourists with his attactive stories of war time, the soldier is no longer there due to his old age. Visitors coming to the cave find it hard to believe there is such a modern hospital in the harsh days of war. In recent years, cave discovery in Cat Ba is attracting more and more tourists, the system of caves with eco tours, community, hiking trips... in Viet Hai, Tran Chau...is practically contributing to overcome the seasonality of Cat Ba tourism. In particular, the historical value and architectural values formed by a combination of natural and human hands, Military Hospital cave is becoming an attractive place in itinerary of the journeys to the beautiful Catba island. A trip to Catba island can be combined with a tour to Halong bay as part of the package.